I recently returned from a five-week “private adventure” that tested me physically, mentally, emotionally and spiritually. I can’t help but wonder if I passed the test. I’ve come to believe that all of life’s challenges are here to teach us something. I’m still catching my breath and figuring out what the lessons were from this adventure. The past two months I had the opportunity to help somebody I love dearly and be by their side through a difficult, life-changing experience. Supporting this person required me to travel across the country and leave my family, friends, and support system behind. To truly help this person and provide the support they wanted, I was also asked to keep most of the details about the experience private. 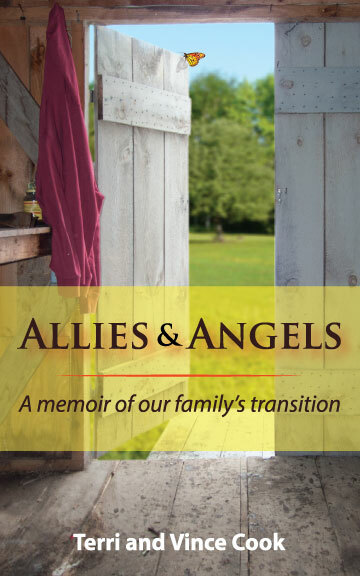 As somebody who recently exposed our family’s secrets, fears, and most personal and private experiences in our memoir, Allies & Angels, I’ve come to value the freeing feeling that comes from being vulnerable and coming out of the closet. Telling our story has helped others through similar or related experiences, and that, in turn, has helped me even more. Carrying a secret and hiding my fears gave them power and control over my life. For me, sharing our story has been freeing, and I can’t help but want to free others. However, I can’t share somebody else’s story and expect it will free them. For one thing, it is not mine to share. I believe one of the lessons of this experience for me is to remember that what is right for me is not necessarily right for others. Not being able to share where I was or what I was doing for nearly two months was extremely difficult and essentially put me back in a closet … even though it was sort of somebody else’s closet. To make it even more challenging, shortly before going away I left my job, wrote a book (which was released while I was across the country), and started two new websites … which I was not able to tend to at all while I was away. I walked away from a successful career to pursue what I believe is my life purpose. I feel compelled to use our life experience as parents of a transgender youth to help others … and increase awareness, acceptance, and compassion in the world. I took enormous steps to start pursuing this passion, and collected a modest number of followers in a short period of time, and then I disappeared off the face of the earth for two months. Yikes! The stress … the pressure … the guilt … the fears are building! I see September as a clean slate to start over and pick up where I left off (or figure out a new place where I need to begin.) I’ll attempt to share parts of my “private adventure” in future blog posts. I’m sure others can learn from my adventure, while I continue to sort out what the lessons were for me. As the mom of a transgender youth, I can relate on many levels to the need for privacy, while at the same time I can be troubled, hurt and broken by the things I need to keep private. Many people don’t understand the challenges faced by transgender people … or the families and people who love them. However, that lack of understanding and awareness in society makes a challenging life experience even harder. Many of the fears and difficulties of being transgender are compounded by the lack of awareness and acceptance in our society. A more general public understanding and acceptance will make it easier for transgender people and their families to find support and live a full life. That is one of the reasons why our family has shared our story and published our book, Allies & Angels. And now that I’m back from my “private adventure,” I’m excited to really begin promoting it and devoting time to this next great adventure in life. Please visit our book’s website (alliesandangels.com) and download the first chapter of our book to check it out. Visit our online store and take advantage of the discount codes for free shipping while also supporting some great organizations. Alternatively, you can also find our book on Amazon.com. Tell your friends and colleagues about our Free eBook Campaign, and please help us spread the word, educate, increase awareness, and open hearts and minds. I can’t wait to share more stories with you. Hooray for September!